Concepts: Growing up can be scary. I love roleplaying games, and playing a game in which the characters are children can be a tricky and rewarding experience. It can also come with a whole load of challenges which we’ll discuss. 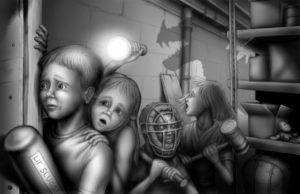 Little Fears is an excellent tabletop roleplaying game by Jason L. Blair. Let’s have a look at the game and see just how well it plays, shall we? Don’t get scared, though! We’re discussing the second edition of the game today, which was called the ‘Nightmare Edition’ and was released in 2007. You play as children between the ages of 6 to 12, in this horror-themed game which sees your youngsters going up against such creepy nasties as werewolves, blob monsters, step-aunts who turn into giant spiders (that’s a thing, right?) and anything else that your illustrious GM can think up. 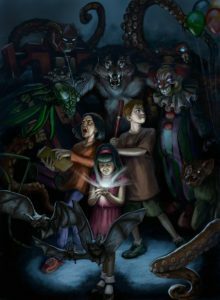 Writing: The tone of the Nightmare Edition of Little Fears is one of Goosebumps-style schlock and adventure, and while you can certainly run it as a far darker and more emotionally intense experience, I’d suggest being very clear with your players about what everybody at the table is wanting before attempting to do that. This is the reason that I have selected this edition of the game. I was first introduced to Little Fears in 2001 in its first edition print, and that edition was a starkly different game as even the front cover will attest. 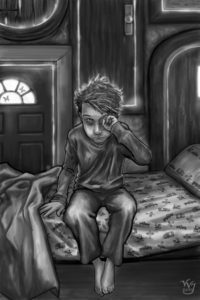 In the first edition, Little Fears had a very strong emphasis on missing children. It was a game in which your child characters were not simply struggling against monsters, but struggling for simple survival. 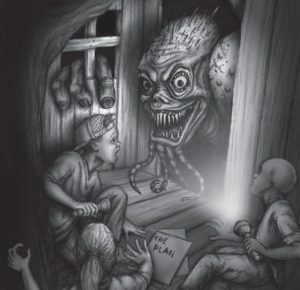 The game incorporated nightmarish threats to them, and not simply threats that would scare children, but dangers that would terrify us on an adult level. This included themes such as abduction, domestic violence, and sexual abuse. Do these themes have a place in a game that is played predominantly for entertainment? While the argument can certainly be made that entertainment can be used as a medium by which one can explore a theme or discuss an issue, doing so requires a particularly respectful and mature handling of an issue in order to not diminish or do a disservice to the subject at hand, and at very worst it can come across as insensitive, offensive and insulting. The very idea of these themes being present in a game can make people uncomfortable, and understandably so. Nightmare Edition goes a long way to easing a lot of those concerns by refocusing the game’s tone towards one that incorporates a lot more of a ‘magical realism’ aesthetic, with monsters that are more traditional and a lot less adult. Your characters are not superhuman, they are just regular children, and this is partly where the fun of the game lies. We don’t tend to spend much of our lives in our childhood years before we are shunted off into the adult world, and the idea of returning to childhood tends to be one that is just as bizarre as any fantasy game. Every challenge you face seems a hundred times bigger – fleeing a post-apocalyptic prison encampment is just as insurmountable a mission as sneaking out of detention. It’s a world in which the upper classes are the adults, who may as well be max-level for all the good it will do you. Mechanics: The game uses a d6 dicepool system. Each character has points to divide among their core skills such as Move, Fight, Think, Speak and Care. They also possess certain qualities which are descriptive phrases that apply to your character, such as “I can climb over things well” or “I am good with animals”. Successes in actions is determined by building a pool of d6 dice equal to your relevant skill, plus any bonuses that your qualities may grant you, and rolling. Sixes can be re-rolled, and the player is looking for the sum of the highest three rolls. So for example, if you have five dice in your pool and your highest numbers are a 5, 5 and 6, you’re scoring at least a 16 to measure against the target number, and that’s before you re-roll that six. When you build your character, you determine how old you want them to be, ranging from 6 to 12. The older your character, the more points you have to divide among your skills. But the younger you make them, the more points you get for Belief. Belief is the closest that this game has to magic – it’s the belief that your plush dinosaur will protect you from the monster that stalks your nightmares, or that a spray from your asthma inhaler will drive away the clown that lurks in the sewers. Belief can be used to give an enemy a weakness or achieve great things. But in order to use it, you need to gamble it – and if you fail your roll, you start to lose faith. Lose it all and, well, that’s just the sad part of growing up. Right in the feels, eh? Design: So, let’s get onto the book itself. The core rulebook is a short paperback with less than 200 pages. But if you get it on pdf, you can also get some of the adventure module supplements along with it too. It has some nice tone-setting fiction, and the art style is suitably realised and evocative. It covers six chapters, with the core rules listed above presented nicely. The GM’s chapters go into detail on how to structure an adventure and run a campaign (this game does lean better towards short campaigns), and some sample monsters and a session to run. Also included is a short chapter on Closetland, a ‘nightmare world’ full of gribbly things that want to spirit the characters away. Closetland was, I should note, part of the first edition that was the more disturbing for an adult audience, as first edition had it ruled over by seven kings and queens, each being represented by one of the seven deadly sins, including Wrath and Lust. This is significantly reworked in this edition. However, if you have a group who feel that this type of horror is something that you would be able to tackle and are confident in doing so, the game’s 10th Anniversary edition includes the original first edition ruleset and details, so you have the choice to explore that if you like as well. Playability: Before I close this article, there are a few other points that I’d like to make – namely that this is a game which should definitely come with trigger warnings. Anything relating to games which include themes of childhood should, especially if the game involves the potential for violence. This game understands this subject perfectly. Let’s lay some cards on the table here – in roleplay games, characters sometimes die. In this game, you play as a child. Ergo, this is a game in which children can die. That’s a subject that is innately upsetting for many people, and the game is fully respectful of that. Included are rules that discuss how to incorporate alternative end-game conditions. These range from the thematically appropriate (your character doesn’t die from the vampire bite, but turns into one of them and flies away to live with the other vampire children) to the more realist (your character’s broken arm is painful, so much so that your character decides he doesn’t want to hang out with his friends any more and risk getting hurt again). For myself, one of the subjects that I find rather unappealing is the idea of children using firearms. Once more, the game recognises this and reacts accordingly. You are left with the distinct feeling that this is a game that understands the very core concept that everybody’s individual mileage varies and treats the audience with the respect to choose how they want to involve these subjects in their game. Conclusion: Little Fears is one of my favorate roleplaying games. It’s stylistic fun and easy system allows the players to get thoroughly invested in the work of playing characters to whom the world is so much larger than it seems to us, and where shadows are all the more terrifying. As we grow older, we are confronted with a reality in which horror is a far less fantastical and far more insidious element, sometimes it just feels so much more rewarding to sneak out of your parent’s house at midnight so that you and your friends can go club an evil clown in the face with a baseball bat. FINAL THOUGHTS: A fun and involving role-playing game that is both accessible for young audiences and adults alike, highly flexible and providing a great arena for exceptional horror storytelling.